"Our former vice president. 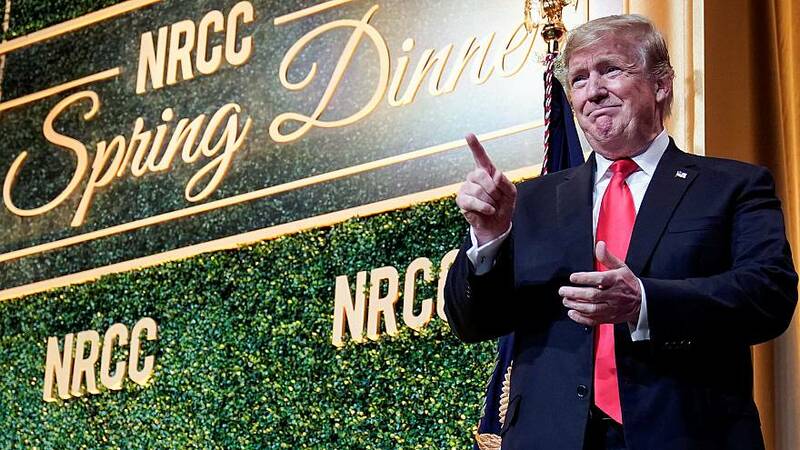 I don't know him well," Trump said at a fundraising dinner for the National Republican Congressional Committee in Washington. "Was gonna say, welcome to the world, Joe. You having a good time, Joe? Are you having a good time?" "The socialists are really taking care of him," Trump said. "In my many years on the campaign trail and in public life, I have offered countless handshakes, hugs, expressions of affection, support and comfort," Biden said in a statement released Sunday. "And not once — never — did I believe I acted inappropriately. If it is suggested I did so, I will listen respectfully. But it was never my intention. I may not recall these moments the same way, and I may be surprised at what I hear." "I'm automatically attracted to beautiful — I just start kissing them. It's like a magnet. Just kiss. I don't even wait. And when you're a star, they let you do it. You can do anything," Trump said in the video from between takes during filming of an "Access Hollywood" episode. "Neither the Bernie Sanders campaign, nor anyone involved in it, planted, planned, persuaded, cajoled or otherwise urged Lucy Flores or anyone else to tell their story," Shakir told The Daily Beast. "Full stop, period, end of sentence. I don't want to hear it. We didn't play a role."